Does Thailand's Military Answer to the Government? After antigovernment protesters invaded the country's parliament and stripped military police of their weapons, Thailand's Prime Minister Abhisit Vejjajiva declared a state of emergency in Bangkok and surrounding provinces on Wednesday, April 7. By invoking emergency rule, however, Abhisit has staked his premiership and his political future on cooperation from what may be the most powerful and unpredictable player in Thailand's politics  the military. Will the military cooperate with the Prime Minister? Just as rapidly as the state of emergency was imposed, rumors began circulating concerning the loyalties of the commanders  because in Thailand, unlike in most developed democracies, the military doesn't always answer to the government. "The army is like a racehorse, and governments are merely jockeys who come and go," said Privy Councilor Prem Tinsulanonda, a former army chief and Prime Minister, during a speech to cadets in July 2006. "The [military's] owners are the nation and the King." Under Thailand's constitution, King Bhumibol Adulyadej, a constitutional monarch, is commander in chief, although he does not appear to involve himself directly in military affairs. Two months after Prem's speech, the army ousted elected Prime Minister Thaksin Shinawatra in a bloodless coup. Over the past several weeks, the protesters on the streets of Bangkok demanding that Abhisit dissolve parliament and call new elections have been, by and large, Thaksin supporters, known as the Red Shirts for the color they wear, who want him back. While the coup against Thaksin came as a surprise because there hadn't been one in 14 years, military ousters have been commonplace throughout modern Thai history. The military has staged 18 successful coups since 1932, when a group of army officers and intellectuals overthrew the last absolute monarch. Since then, the military has ruled overtly or has influenced politics from behind the scenes. In May 1992, Bangkok's middle class rose up against a general who usurped power following an election in which he was not a candidate. Soldiers responded with deadly force. King Bhumibol intervened to end the bloodshed and restore democracy, and many believed the days of coups in Thailand had passed, as the army appeared to gradually retreat from any overt political role. Soldiers, however, were still meddling in politics. According to poll monitors, military officers have interfered in just about every election since 1992. Military personnel are part of the patronage networks of leading politicians, whose influence they rely upon to advance their careers in the armed forces. This provides incentive for soldiers to try to influence political outcomes. The most blatant example of such patronage came when Thaksin appointed his cousin as army chief in 2003. That move sparked a backlash among soldiers who were not part of Thaksin's patronage network. They feared the army would become a political tool for the Prime Minister, who was known for his inability to tolerate dissent. In 2006, top generals believed Thaksin was planning to remove them for refusing his orders to crack down on protesters, so they moved against him while he was attending a U.N. meeting in New York. In one of the many ironies in Thai politics, the man they installed as Prime Minister, General Surayud Chulanont, had, as army chief, opposed soldiers' meddling in politics. The Thai army sees itself as an honest and selfless force for developing the nation and a moral counterpoint to corrupt politicians, according to Chris Baker, co-author of A History of Thailand. This conveniently ignores a long history of corruption within the military and abuses of citizens' rights. But unlike Western democracies, in which power is divided among executive, legislative and judicial branches, Thailand has long relied on a balance of power among several institutions, including the legislature, the bureaucracy, the monarchy and the military. While Thailand's governments have promoted modern democracy and most Thai citizens have come to expect it, attempts to radically upset this balance  as Thaksin did by appointing his loyalists to key commands  risk sparking the kind of reaction that resulted in the 2006 coup against him. Armed with this view, the military seemingly does not regard itself as beholden to the nation's elected leaders. The army has rejected orders from four different Prime Ministers to quash demonstrations against their rule  at the start of the Asian economic crisis in 1997, during street protests against Thaksin in 2006, in 2008 when protesters occupied the Prime Minister's office and, most notoriously, that same year when Bangkok's international airports were shut down by demonstrators in order to force Thaksin-allied Prime Ministers from office. Some believe the army refused to act because it did not want blood on its hands from saving politicians, which would revive the black stain on its reputation from May 1992, when dozens were killed. Others believe the army's inaction was intended to advance its own political interests. Following Thaksin's ouster, the army clearly has become more involved in politics, despite ceding overt power to elected politicians after little more than a year. It played a key role in Abhisit's rise to the premiership, helping to broker deals among politicians who had been loyal to Thaksin so they would join Abhisit's coalition. 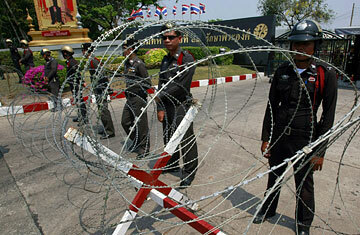 The generals also used their troops to break up Red Shirt riots in April 2009 in Bangkok aimed at ousting Abhisit. Among the military's rewards have been large increases in budget allocations under Abhisit's administration and few questions about purchasing irregularities. Another irony is that Abhisit's Democrats have traditionally been the party to most strongly advocate having a professional military uninvolved in politics. But their interests have converged in an anti-Thaksin alliance as the ousted leader continues his involvement in politics while in exile, allegedly funding the current protests. The army appears to need Abhisit to stay in power: army chief General Anupong Paochinda is slated to retire in October, and his anointed successor, General Prayuth Chan-ocha, is known to be unsympathetic to Thaksin. Should Abhisit be forced from office by Red Shirt protests and Thaksin's allies win a new election before October, they could select another general for the top slot who would support Thaksin's return. Such soldiers exist  Thais call them "watermelon soldiers," because they wear green on the outside but are red, the color of Thaksin's followers, on the inside. Despite this convergence of interests, the army's support for Abhisit's emergency decree does not appear certain. A day after the decree was issued, the military had yet to take action. Perhaps the military fears another May 1992, in which by cracking down on protesters, it will become the villain. Perhaps new deals are being struck. Or maybe the high command is still preparing its plans for clearing the streets. The next few days may tell. But when Abhisit appeared on national television to announce emergency rule, he was flanked by politicians  and noticeably no generals.